Ship to be escorted to Ashdod? VIDEO - Navy vessels on Saturday morning approached the Irish-owned Gaza-bound Rachel Corrie ship and warned it to stop moving towards the blockaded Strip. The army invited the ship to unload its humanitarian aid in Ashdod and transfer it to Gaza under supervision, but was turned down. Earlier this week, Navy commandos took over six Gaza-bound vessels in a bloody raid which left nine activists killed. According to the Israel Defense Forces Spokesperson's Office, the ship was told: "This is the Israeli Navy. You are approaching an area of hostility, which is subject to a naval blockade. The Gaza area, the coastal region and the Gaza harbor are closed to all maritime traffic… You are hereby requested to change your course and refrain from entering the area. I repeat: Delivery of humanitarian supplies to the civilian population in the Gaza Strip is possible, through formal land crossings between Israel and the Gaza Strip, subject to prior coordination with the Israeli authorities." The ship's passengers, the IDF said, chose to ignore the order given to them about 70 kilometers from the coast and to continue towards Gaza. Additional warnings were also ignored. "If they won't leave us any choice, we'll have to board the ship," Lieutenant-Colonel Avital Liebovich told Reuters. A huge Palestinian flag has been stretched on the deck. The Palestinian welcoming committee waiting for the Irish-owned Rachel Corrie aid vessel near the Gaza coast said early Saturday that the ships had been seized by the Israeli Navy in high sees, about 55 kilometers (34 miles) from the Strip. "A number of Israeli ships encircled the vessel and stopped it from reaching the Gaza Strip," said the committee's spokesman, Amjad al-Shawa, who spoke to the ship's crew shortly before communication was cut off. Rami Abdo, the committees' coordinator, accused Israel of intentionally disrupting the communication means. He noted that senior Malaysian officials, including parliament members, were on the ship. The al-Jazeera network reported that the ship had been seized, but that no one had taken over it. An Israel Defense Forces official said the vessel was being monitored but did not confirm that it was stopped. "We have not been in touch with the ship for an hour and a half," Greta Berlin of the Free Gaza movement that sent the 1,200-ton Rachel Corrie told Ynet, adding that at around 7 am the vessel "was making its way from the Egypt area to Gaza." Shortly after 5 am Israel time, Greta Berlin said the vessel was 35 miles (56 kilometers) from Gaza's shores. "There were two warships in the back of them ... and a smaller boat was approaching," Berlin said from the movement's headquarters in Cyprus, citing a passenger on board. Israeli troops still hadn't boarded the Rachel Corrie nearly two hours later, and Free Gaza's lawyer, Audrey Bomse, said the Israeli vessels had not yet made contact with the activists' ship. Activists on board the Irish boat, including a Nobel Peace Prize laureate, have insisted they would not resist if Israeli soldiers tried to take over their vessel. They rejected Israeli and US appeals to bring the ship to an Israeli port instead. The Cambodian-flagged Rachel Corrie – named for an American college student who was crushed to death by a bulldozer in 2003 while protesting Israeli house demolitions in Gaza - was carrying hundreds of tons of aid, including wheelchairs, medical supplies and cement. 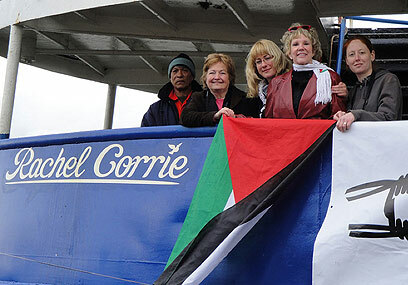 A Malaysian organization whose members are on the ship released a statement saying that in light of concerns by the Israeli authorities, the activists aboard the MV Rachel Corrie have unanimously agreed to allow for the inspection of the cargo. According to a statement published on the Perdana Global Peace organization's website, the activists "request and invite for an independent international body, preferably inspectors from the United Nations, to board the ship and do the necessary to certify as to the nature of the cargo on board." The statement added that "the cargo on board the MV Rachel Corrie is void of any weapons or any apparatus that may be used for harmful purposes." The organization said, however, that the activists had unanimously agreed to proceed with their voyage to Gaza "to enable them to fulfill the hopes and aspirations of the people of Gaza, of which the cargo on board the MV Rachel Corrie, belong to. It is also to fulfil the hopes and aspirations of the various donors of the goods who wished to see the aid being delivered directly to Gaza and to the people of Gaza and not through any third party. This latest attempt to breach the blockade differs significantly from the flotilla the Israeli troops intercepted on Monday, killing eight Turks and an American after being set upon by a group of activists. Nearly 700 activists had joined that operation, most of them aboard the lead boat from Turkey that was the scene of the violence. That boat, the Mavi Marmara, was sponsored by an Islamic aid group from Turkey, the Foundation for Human Rights and Freedom and Humanitarian Relief. Israel outlawed the group, known by its Turkish acronym IHH, in 2008 because of alleged ties to Hamas. The group is not on the US State Department list of terror organizations, however. By contrast, the Rachel Corrie was carrying just 11 passengers, whose effort was mainly sponsored by the Free Gaza movement, a Cyprus-based group that has renounced violence. Irish Nobel Peace Prize laureate Mairead Corrigan told The Associated Press from the ship Friday that the group would offer no resistance if Israeli forces came aboard. "We will sit down," she said in a telephone interview. "They will probably arrest us ... But there will be no resistance." Corrigan said the activists would "not be diverted anywhere else. We head to Gaza in order to deliver the humanitarian aid and to break the siege of Gaza." In Washington, the State Department said US officials had been in touch with "multiple" countries, including the Israeli and Irish governments, about the latest effort. "Everyone wants to avoid a repetition of this tragic incident," spokesman P.J. Crowley said. Later, National Security Council spokesman Mike Hammer said the Rachel Corrie should sail to Ashdod in the interest of safety. He said Washington was working "urgently" with Israel, the Palestinian Authority and other international partners to develop new procedures for delivering more goods to Gaza, while blocking the entry of weapons. "The current arrangements are unsustainable and must be changed," he said. International condemnation continued Friday, with protests in Syria, Greece, Mauritania, Bahrain and Malaysia, where some demonstrators burned Israeli flags and carried mock coffins. In Norway, the military canceled a seminar scheduled for later this month because an Israeli army officer was to have lectured. On Friday, the Israeli military released what it said was an edited radio exchange with the flotilla, captured from its own communications equipment, in which unidentified male voices were heard making anti-Semitic and anti-American comments. See all talkbacks "'Rachel Corrie' ignores Navy request to stop "